Peter M. Manikas is a senior associate and regional director for Asia programs at NDI. Previously, he was the Institute’s chief of party in Bangladesh, Cambodia, Indonesia and Malawi. 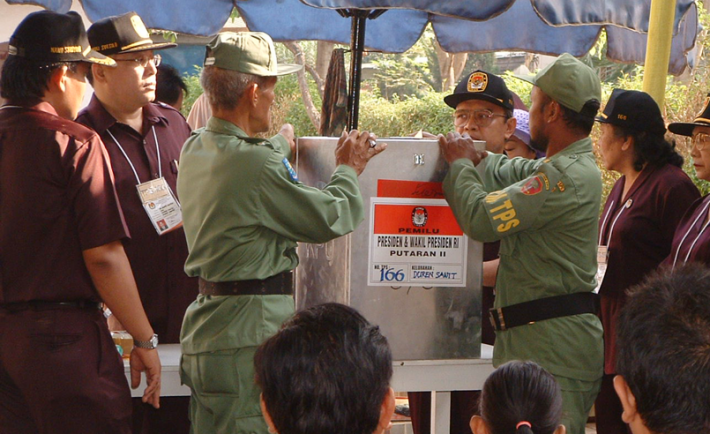 Officials open the polls in Indonesia in September 2004. No single trend -- neither retreat nor revival -- defines the direction of democracy in Asia. We recently have seen a military coup, followed by a ban on political activity in Thailand; in Hong Kong, the government in Beijing has remained intransigent, insisting on its version of universal suffrage; and in Burma, progress toward political reform seems to have stalled as critical elections approach, although constitutional reform remains a possibility. The opinions expressed by the authors and those providing comments are theirs alone and do not necessarily reflect the opinions of the National Democratic Institute. Are Yemen’s Houthi Rebels Signaling A Move Toward Democracy? The National Democratic Institute is a nonprofit, nonpartisan organization working to support and strengthen democratic institutions worldwide through citizen participation, openness and accountability in government.